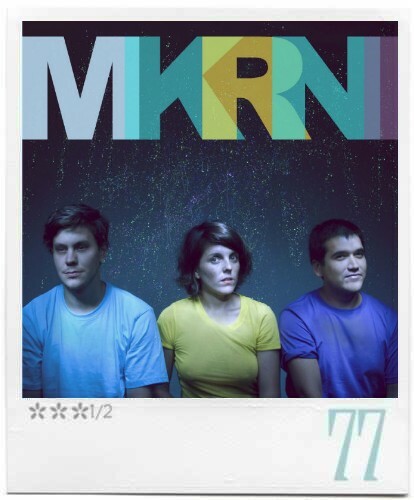 Member of the thriving Chilean scene since 2008, MKRNI is definitely one of its most intriguing acts. Making the most out of their keyboards, synthesizers, and drum machines, producers and DJs Marcelo Miopec, Seba Roman (Roman S), and Elisita Punto (also a prolific visual artist) approach their collaboration as an opportunity to explore and evolve musically. Quietly released last April, Jumper gives the impression of an electro-pop demo where anything goes and every song on the album is different both in genre and influence. Elisita Punto’s sassy, casual vocals ride distinctively upon the extended repetitions and enigmatically crafted effects and it’s basically what anchors the trio's second EP. The two singles, “Humedad” and “Srta. Robinson,” clearly demonstrate MKRNI’s ability to create music that will get you moving the coffee table out of the way, kicking up heels, and dancing til dawn. The rest of the album reveals the band’s aspiration to fuse those predominant dance rhythms with pre-Hispanic melodies, post-punk, and krautrock influences. This indiscriminating collection of styles still gifts us with well-executed experimentations, the most convincing ones being "Humedad" and "Andinita." Through Punto’s seductive yet disconcerting tonality and a dulcet beat bordering on cumbia, "Humedad" tastefully refashions tropical psicodélica sounds. This gem could easily be described as one of the most exciting pop tunes to come out this summer. The warm and almost whispered "hace calor sin sol, hace calor sensual" made those particularly execrable hot, sticky days in the city seem bearable. "Andinita" pastes ancestral patterns, creating a distant reggeaton beat. The song reaches the pinnacle when it unravels its prodigious huayno melodies. With some futuristic spatial sonorities, "Srta. Robinson" appears like a satiric Italo disco song. Punto suggests a new imagery for the 1960s American blockbuster, where teachers dance to old school Afrika Bambaataa jams. The other songs found on this EP are more discrete and somewhat lacking in creating a cohesive whole. While "Lorelei" brings into play some yodeling, "Yo no sé" echoes minimal techno songs by recent electro-pop acts like Hot Chip. "Chercan" is an instrumental exploration with sounds of marimba and melodica, discrete voices landing on eerie, worrying beats and dissonant chords, and the post-punk inflected "Shark" is a clever introverted exploration. The trio is definitely fearless of boxes and boundaries. After making audiences from New York, Baltimore, Paris, Berlin, Barcelona, and Sao Paulo bust some serious moves this past summer with Jumper, the band is already announcing a third album entitled Playa Futuro. We’re guessing it will be full of hits. Where do I acquire this album? I must listen!! Featured: Piñata - "Mexican Machotes"
Video: Isla de los Estados - "Balanceo"